I’m a fan of soap. natural handmade and infused with exquisite skin nourishing essential oils especially. I like trying different scents and picking up little-known intricately packaged squares at health food shops or stores like Cost Plus World Market. but even TJ Maxx and Marshall’s carry a nice variety of unique blends. I discovered this silky little suds-maker at my local health food store and it’s like NOTHING I’ve ever used. first we have to talk about the scent: incredibly fresh and while I’ve never been a fan of lemon per se, this is more of a lemon freshly picked from the garden not pine sol or some warehouse fabricated assembly line smell. It suds up nicely, feels so silky in my hands & even silkier on my skin. I feel so soft after showering with this soap. though some might think its pricey at $5/bar, it really is worth the cost. 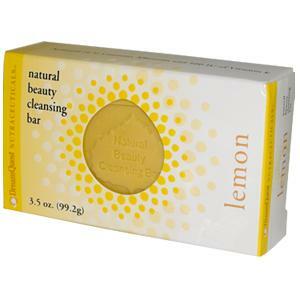 another wonderful thing about this soap – it has a 4.5 pH balance and contains allantoin + 500 IUs of Vitamin E.
I purchase it online now because my local health food store is always out of the lemon scent, so I buy it here. This entry was posted on March 7, 2012 by suite7beautytalk in Beauty, Body, GREEN LIVING, REVIEWS and tagged Dream Quest Nutraceuticals, Essential oil, Lemon, Marshalls, PH, Skin, Soap, TJ Maxx. Bad idea to treat cystic acne solo! Know when to call for backup…. words to 7 describe me. Short. Introvert. Moody. Funny. Observant. Writer. Esthetician. Music. Flawless skin. DIY beauty. Organization. Lab pups. Luminous makeup. Good convos. Pinterest. Tumblr. StumbleUpon. Organic Beauty Talk. No More Dirty Looks. 8tracks. YouTube. things 7 i can't be without. cell phone. lip balm. laptop. ipod. eyeliner. oil sheets. daily solitude. calamari. fish tacos. caesar salad. french toast. Lawry's prime rib. chocolate chip cookies. red velvet cheesecake. brown. charcoal grey. black. yellow. white. blush. deep pink. voices 7 i listen to. adele. jill scott. marsha ambrosius. renee olstead. micheal jackson. diana krall. beyonce.